The Lady Outlaw is here. Plus, enter to win a Clean Teen Mystery Box! Robin of Lockesly was neither the son her father wanted, nor the daughter her mother expected. When she refuses an arranged marriage to a harsh and cruel knight, the deadly events that follow change her destiny forever. After a night of tragedy, Robin and the few remaining survivors flee to Nottingham. With a newfound anonymity, they start to live different lives. There, she and her band make mischief, robbing from the rich and giving to the poor. But charity isn’t the only thing she wants–she wants revenge. 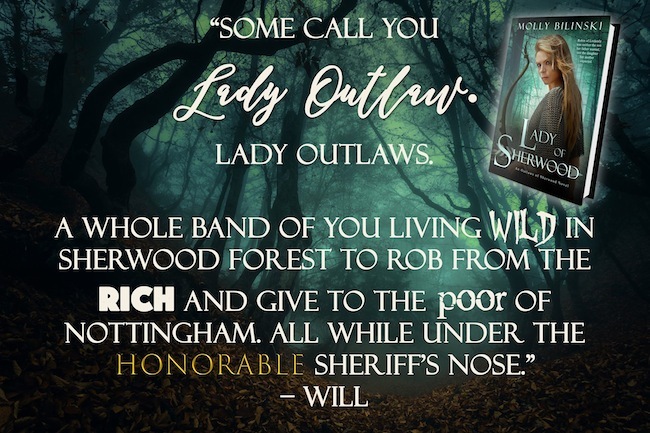 As the sheriff draws his net closer, Robin’s choices begin to haunt her. She’ll have to choose between what’s lawful and what her conscience believes is right–all while staying one step ahead of the hangman. 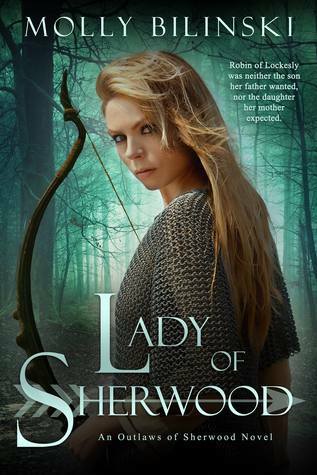 Lady of Sherwood is a unique young adult retelling of the beloved Robin Hood legend. Filled with action and romance, this new series follows a teenage heroine through her fantastic, yet dangerous adventures. Other girls—some of the youngest ones from the kitchen—came from the brush. Smoke clung to them like a shroud, and tears had run in rivers down soot-stained cheeks. Ginny, the youngest at six, ran to Jemma and attached herself like a limpet to the older girl’s legs. “Where is everyone else?” Robin asked, glancing between them and then back at the flaming manor. “Where is—where’s—” Her face heated even as the rest of her body grew chilled, and she stuffed her first in her mouth to muffle her scream. “Except you lot?” Jemma inquired. “And my—my mother?” Robin took a deep, shuddering breath. “And she said nothing?” Robin’s heart beat hard against her ribcage. “Lady was very brave,” Ginny murmured. “She was,” Robin agreed. “Like you are. You all.” She looked at each of the other girls, who stared back, clearly waiting. It hit her then—they were waiting for her. With the only survivors of the manor in front of her, and her mother dead—God rest her soul, God hold them all in His hand—it occurred to her in that moment. She was the Lady of Lockesly. 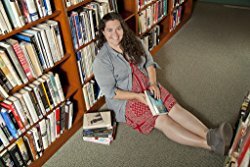 Molly is a 2013 graduate of William Smith College with a bachelors in chemistry. She puts her science powers to use by day and is a novelist by night (and weekend…and any five minutes she can find). When she’s not writing or working, she’s scoping out coffee shops, exploring her new city (Buffalo, NY), taking day trips to Canada, and putting together puzzles. GIVEAWAY! ENTER TO WIN A CTP MYSTERY BOX!